I raised Charlie from the time he was just a tiny baby (a couple of days old). 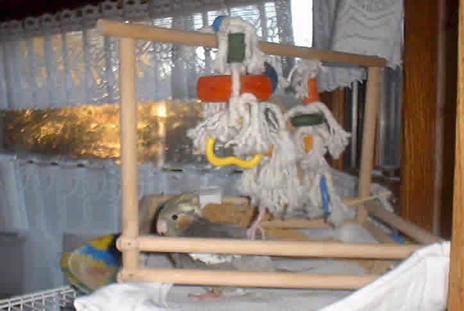 My friend had problems with her tiel parents, who were not experienced yet at raising babies and thus many of the babies died from neglect. We thought our chances of the tiels making it would be better if handraised from very very early. So I took some of the babies, including Charlie. Once we noticed that this baby was handicapped, I decided to keep him as my pet and I am sure glad I did. Charlie (formerly called "Troubles" because he kept attacking our cats ;-) has become an integral part of my family. He is a wonderful pet, who enjoys life. During the daytime he likes to stay on his specially made gym. He loses balance easily as his foot reaches into the air. Without the side bars to hang on to, he is helplessly fluttering about. Charlie cannot walk. Even standing upright - without the side bars - is hard for him. 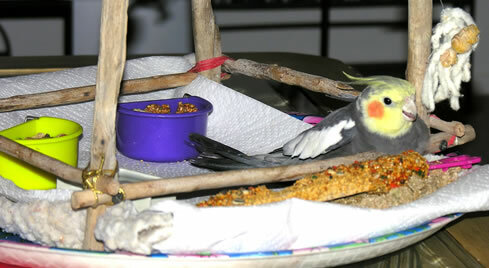 Here are a couple of photos of him when he was still a "youngster" as is apparent from his plain plumage. I am certain that Charlie is a happy bird. I can see him look out of the window, get excited when he sees me, greet the incoming rays of sun with his delightful singing, and see his eager face when he knows it's playtime again. I take his gym and place it next to me and he gets to sit on my lap, or even "fake" being "normal" by sitting on my shoulder (with his "bad" leg securely placed against a pillow behind my head). That he surely loves. I dare say that he is so much happier than those poor "perfect" tiels that are kept in their cages all day long, without interaction, love or basic nurturing.